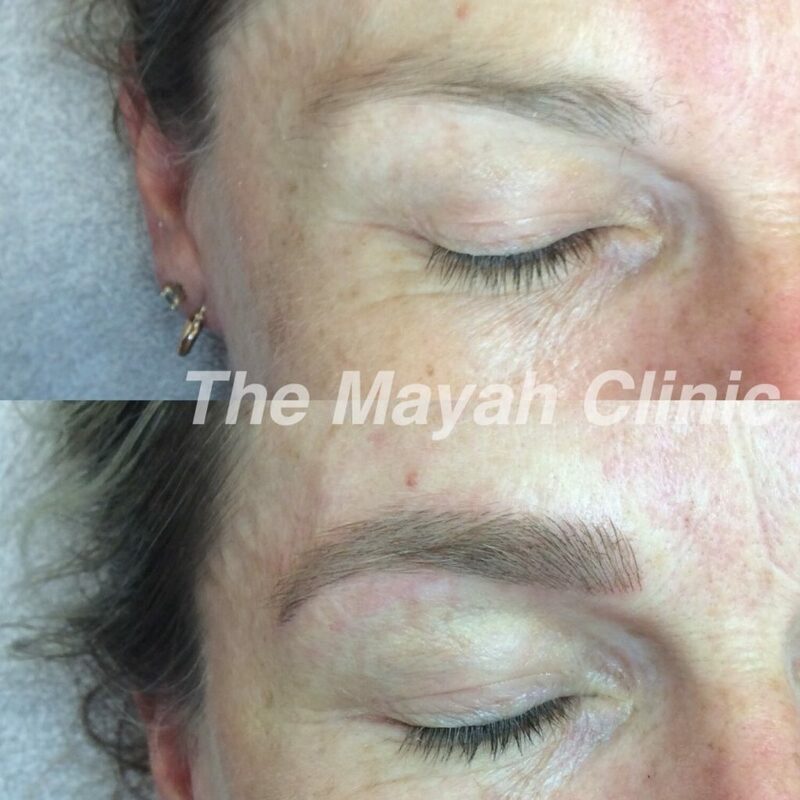 What is Cosmetic Tattooing (Permanent Makeup) or Micropigmentation? 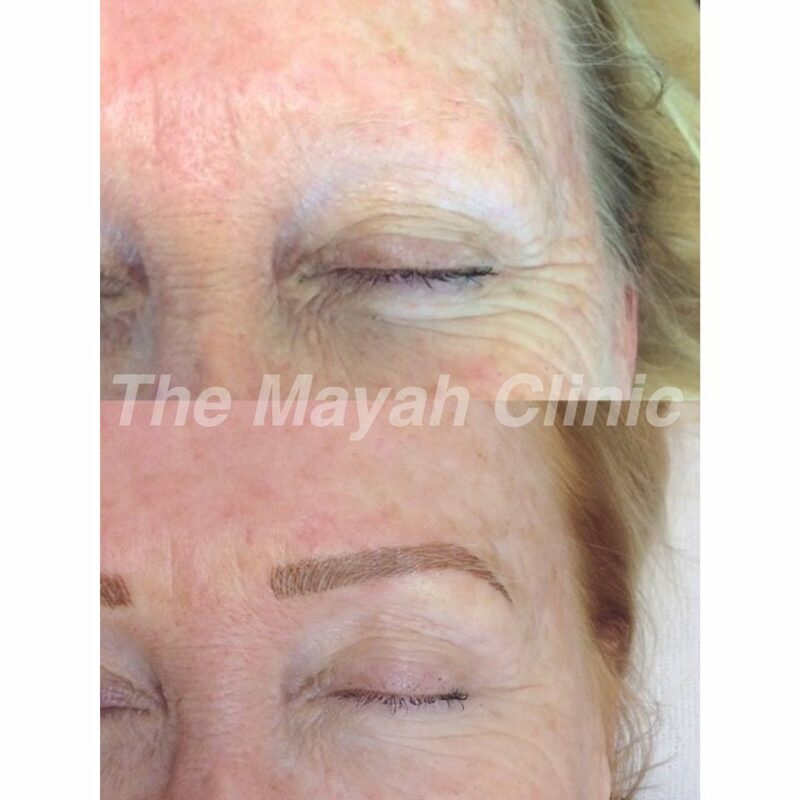 It is a procedure in which pigments are implanted beneath the first layers of skin to give a lasting “makeup” effect. The basic technique is the same as for traditional tattooing, however there are major differences. The skin of the face is more delicate than on the body with more superficial blood vessels, and so requires a special approach. Machines used in micropigmentation are quieter, lighter, easier to handle and generally do not penetrate the skin as deeply. The pigments used are mostly softer colours and as such will not last as long as a traditional tattoo. If the luxury of always having perfectly-shaped brows or beautifully-defined eyes is for you, then yes! It is great for women of all ages. Whether you are an active sports-person who wants her makeup look to stay, a person where visual problems or dexterity issues make fine makeup- application challenging, or you just want to wake up and go with no fuss, then micropigmentation may be the answer for you. Micropigmentation is a journey. You will first have a design consultation. At this time, Jasmine will explain the tattooing process to you, and advise you about things to avoid before your treatment, and things to do to prepare yourself. She will discuss the result you want and design your personal tattoo. She will discuss medical conditions that may mean tattooing is not as suitable for you.The cost of this consultation is redeemable on your tattooing cost. Following your first treatment there will be shrinking and fading of your colour. For this reason you will always need a second visit a month after your first. Both of these visits are covered by your initial fee. 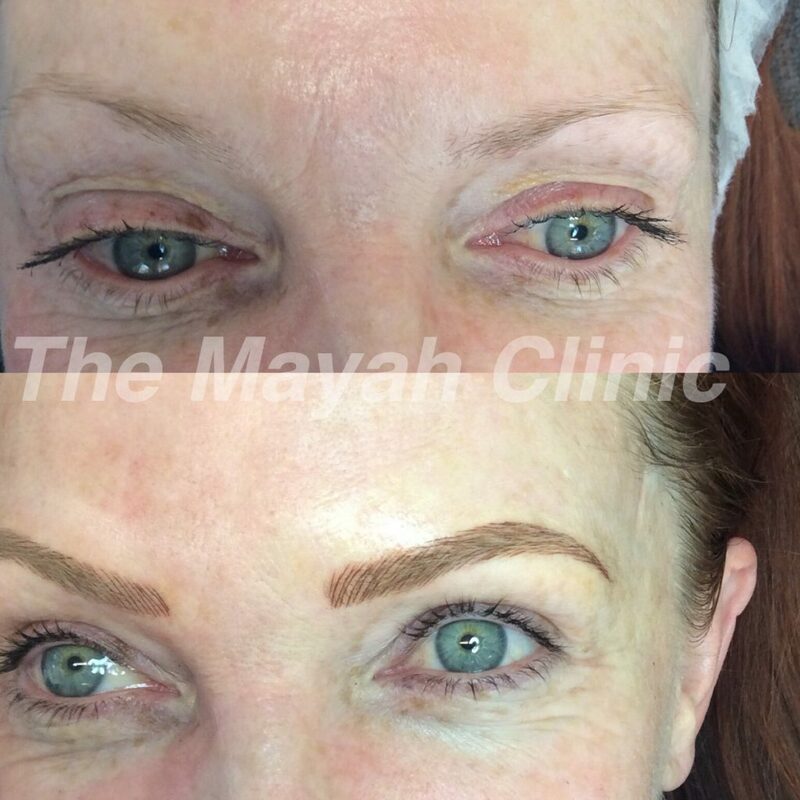 For eyebrows and eyeliner fading varies depending on skin type and colour, pigment colours chosen and technique of application. These issues will also be discussed at your consultation. A topical, anaesthetic gel is applied before and during your treatment to make the experience as comfortable as possible. Of course, there will always be some discomfort with tattooing, and the perception of pain is very individual. For most people the sensation is like a mild vibrating feeling at first , becoming tender towards the end. At The Mayah Clinic we have Dr Holmes available to provide a dental block for any lip colour application. Micropigmentation is not permanent and generally lasts 3-5 years. Lighter colours may only last 1-2 years. Colours can sometimes change a little with time and need colour correction. One suggestion is to have a short annual touch-up treatment to maintain your ideal colour. Will my tattoo scab up like a body tattoo? Because microneedling needles do not penetrate as deeply as body-tattoo needles, it will not form a thick crust if you care for it carefully as Jasmine instructs you. Larger areas can crust more easily. Around 4-6 days the top layer of ink will start to exfoliate off. Gentle care with Bepanthen or Protatt is vital in this first week. Avoiding makeup over the 4 days post treatment is important to preserve your colour during this healing phase. 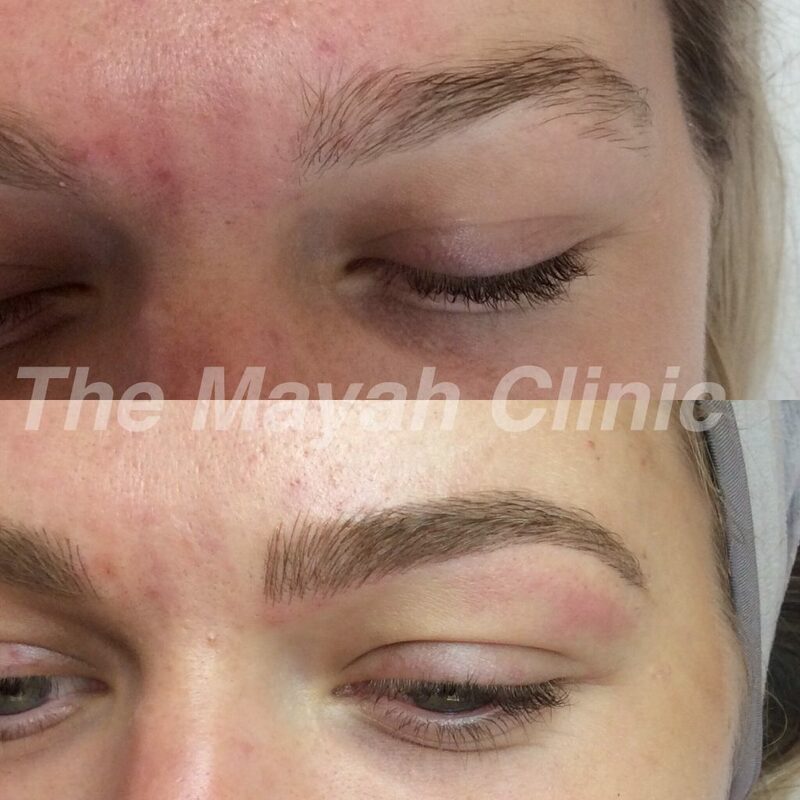 When you have your tattooing performed in a clinical setting like The Mayah Clinic, you can be sure of receiving treatment under sterile conditions with the best-quality pigments, sterile single-use needles, disposable casings, tips, skin swabs, masks and gloves. Our Skin Therapist, Jasmine, is a fully-certified, cosmetic tattooist. She has trained both in Sydney and with an advanced trainer in our own clinic. Her beautiful results can be seen in our Photo Gallery. Allergies to the dye are very rare. If you are worried about this, we can do a small patch test behind your ear. Also, you are in a clinic with access to medical care if that should ever be needed. What will it look like straight after my cosmetic tattoo treatment? There will be some swelling and tenderness afterwards. The pigment colour is also darker immediately after. You must remember that on average you can lose 40% of your colour intensity over the first week. Eyes/eyeliner will be a little more puffy the next day. Eyebrows are usually less puffy the next day. *Please be aware tattooing prices can vary depending on each individual tattooing treatment. Final prices will be discussed in consultation.